نژاد مقدم, شبنم, ایمانپور, محمدرضا, جعفری, ولی اله, صفری, رقیه. (1397). ارزیابی اثر عصاره هیدروالکلی گزنه (Urtica dioica) بر برخی شاخص های خون شناسی و بیوشیمیایی خون ماهی قرمز (Carassius auratus). فصلنامه محیط زیست جانوری, 10(2), 189-196. شبنم نژاد مقدم; محمدرضا ایمانپور; ولی اله جعفری; رقیه صفری. "ارزیابی اثر عصاره هیدروالکلی گزنه (Urtica dioica) بر برخی شاخص های خون شناسی و بیوشیمیایی خون ماهی قرمز (Carassius auratus)". فصلنامه محیط زیست جانوری, 10, 2, 1397, 189-196. نژاد مقدم, شبنم, ایمانپور, محمدرضا, جعفری, ولی اله, صفری, رقیه. (1397). 'ارزیابی اثر عصاره هیدروالکلی گزنه (Urtica dioica) بر برخی شاخص های خون شناسی و بیوشیمیایی خون ماهی قرمز (Carassius auratus)', فصلنامه محیط زیست جانوری, 10(2), pp. 189-196. نژاد مقدم, شبنم, ایمانپور, محمدرضا, جعفری, ولی اله, صفری, رقیه. ارزیابی اثر عصاره هیدروالکلی گزنه (Urtica dioica) بر برخی شاخص های خون شناسی و بیوشیمیایی خون ماهی قرمز (Carassius auratus). فصلنامه محیط زیست جانوری, 1397; 10(2): 189-196. امروزه در آبزی­ پروری استفاده از محرک ­های ایمنی به­ ویژه گیاهان دارویی به ­عنوان جایگزین مواد شیمیایی و آنتی ­بیوتیک ­ها در کنترل و پیشگیری بیماری ­های آبزیان مورد توجه بسیاری از محققین قرار گرقته است. این مطالعه به ­منظور ارزیابی اثر تجویز رژیم غذایی عصاره­ گیاهی گزنه (Urtica dioica) بر برخی پارامترهای خون­ شناسی و بیوشیمیایی خون ماهی قرمز (Carassius auratus) به­ مدت 8 هفته صورت گرفته است. تیمارهای آزمایشی 3 تیمار عصاره گیاه گزنه با دوزهای 2، 4 و 8 ­گرم در کیلوگرم غذا و یک تیمار شاهد (بدون عصاره­ گیاهی)، هرکدام با 2 تکرار حاوی 5 ماهی با میانگین وزنی 4/70±21/88، در 8 مخزن توزیع شدند. نتایج نشان داد که افزایش میزان عصاره گیاهی سبب بهبود شاخص ­های خونی و بیوشیمیایی شد که البته این افزایش در هیچ­ یک از پارامترهای اندازه ­گیری ­شده در بین تیمارها معنی ­دار نبود. به ­طوری ­که میزان شاخص ­های خون ­شناسی (گلبول قرمز و سفید، هماتوکریت) و اندیس ­های خونی (MCV، MCH و MCHC) بین تیمارهای آزمایشی اختلاف معنی ­داری نشان ندادند (0/05<p). میزان آلبومین در تیمار تغذیه شده با عصاره گزنه به ­ویژه در سطح 4 گرم بر کیلوگرم غذا به­ طور معنی­ داری (0/05>p) نسبت به گروه شاهد و سایر تیمارهای تغذیه شده با عصاره گزنه افزایش نشان داد. در مقایسه مقادیر گلوکز، کلسترول و تری­ گلیسیرید سرم خون ماهیان قرمز تغذیه شده با عصاره گزنه در پایان آزمایش با تیمار شاهد اختلاف معنی ­داری (0/05<p) مشاهده نگردید. به ­طورکلی می ­توان نتیجه گرفت که غلظت ­های بالای گزنه می ­تواند موجب بهبود عملکرد برخی شاخص ­های فیزیولوژیک ماهی قرمز گردند. بهمنی، م.؛ حسینی ­فرد، س.م. و اهدایی، م.، 1393. مطالعه اثرات عصاره­ های آبی و الکلی گیاه مرزنجوش(Origanum vulgare L.) بر درصد بقاء و برخی از شاخص های خونی ماهی کپور معمولی آلوده با آئروموناس هیدرو فیلا (Aeromunas hydrophila). فصلنامه علمی پژوهشی اکوبیولوژی تالاب. سال 6، شماره 21، صفحات 73 تا 81. زرگری، ع.، 1375. گیاهان دارویی. انتشارات دانشگاه تهران. چاپ چهارم. صفحات 106 تا 117. کاظمی، ر.ا.؛ پوردهقانی، م.؛ یوسفی ­جوردهی، ا.؛ یارمحمدی، م. و نصری­ تجن، م.، 1389. فیزیولوژی دستگاه گردش خون آبزیان و فنون کاربردی خون­ شناسی ماهیان. انتشارات بازرگان، 194 صفحه. نژادمقدم، ش. و صفری، ر. در دست چاپ. ارزیابی اثر عصاره گیاه گزنه (Utrica dioica L) بر پاسخ ایمنی موکوسی و بیان ژن مربوط به ایمنی TNF-alfa در ماهی قرمز (Carassius auratus gibelio). همایون ­پور، م.، 1394. تاثیر پودر گزنه بر شاخص ­های رشد و بازماندگی کپور معمولی (carpio Cyprinus). پایان­ نامه کارشناسی ارشد تکثیر و پرورش آبزیان، دانشکده شیلات، دانشگاه زابل. 58 صفحه. Aldrin, J.F. ; Messager, J.L. and Saleun, S., 1984. Analyses sanguines de turbots d’elevages immature8 (Scophtalmus maximus L.). Aquaculture. Vol.40, pp: 17-25. Allardice, P., 2003. A-Z of companion planting. United Kingdom: Harper Collins Publishers; 1993. 208 p.
Al-Salahy, M.B., 2002. Some physiological studies on the effect of onion and garlic juices on the fish, Clarias lazera. Fish Physiology and Biochemistry. Vol. 27, pp: 129-142. Anderson, D.P., 2003. Disease of Fishes. Narendra Publishing House Delhi. pp: 22-73. Atkinson, E. and Judd, F.W., 1978. Comparative hematology of Lepomis microlophus and Ciehlasoma ceyanoguttatum. Copeia. Vol. 2, pp: 230-237. Awad,E. ; Austin, D.R. and Lyndon, A., 2013. Effect of black cumin seed oil (Nigella sativa) and nettle extract (Quercetin) on enhancement of immunity in rainbow trout, Oncorhynchus mykiss (Walbaum). Aquaculture. Vol. 388-391, pp: 193-197. Ballarin, L.; Dalloro, M.; Bertotto, D.; Libertini, A.; Francenscon, A. And Babaro, A., 2004. Haematological parameters in Umbrina cirrosa (Teleostei, Sciaenidae): a comparison between diploid and triploid specimens. Comparative biochemistry and physiology. Vol. 138, pp: 45-51. Basu, N.; Nakano, T.; Grau, E.G. and Iwama, G.L., 2001. The effect of cortisol on heat stock protein 70 levels in two fish species. General and Comparative Endocrinology. Vol. 124, pp: 97-105. Belanger, J.M. ; Son, J.H. ; Laugero, K.D. ; Moberg, G.P. ; Dorochov, S.I. ; Lankford, S.E. and Cech, J.J., 2001. Effects of short-term management stress and ACTH injections on plasma cortisol levels in cultured white sturgeon, Acipenser transmontanus. Aquaculture. Vol. 203, pp; 165-176. 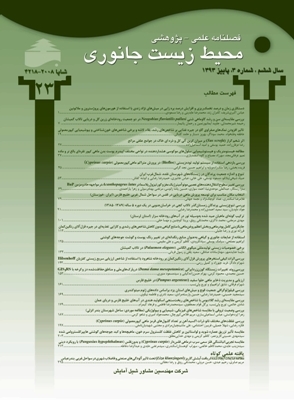 Binaii, M.; Ghiasi, M.; Farabi, M.; Pourgholam, R.; Fazli, H.; Safari, R.; Alavi, E.; Taghavi, M. and Bankehsaz, Z., 2014. Biochemical and hemato-immunological parameters in juvenile beluga (Huso huso) following the diet supplemented with nettle (Urtica dioica). Fish and Shellfish Immunology. Vol. 36, pp: 46-51. Blaxhall, P.C. and Daisley, W., 1973. Routine haematological methods for use with fish blood. Journal of Fish Biology. Vol. 5, pp: 771-781. Brufa, J.; Esteve, E. and Tarradas, J., 2015. Review of immune stimulator substances/agents that are susceptible of being used as feed additives: mode of action and identification of end-points for efficacy assessment. External Scientific assessment. pp: 1-267. Cataldi, E.; Di Marco, P.; Mandich, A. and Cataudella, S., 1998. Serum parameters of Adriatic Sturgeon Acipenser nac­carii (Pisces: Acipenseriformes): Effects of temperature and stress. Comparative Biochemistry and Physiology. Vol. 120, pp: 273-278. Chang. J.P.; Johnson. J.D. ; Van Goor, F.; Wong, C.J. ; Yunker, W.K. ; Uretsky, A.D.; Taylor, D.; Jobin, R.M. ; Wong, A.O. and Goldberg, J.I., 2000. Signal transduction mechanisms mediating secretion in goldfish gonadotropes and somatotropes. Biochem. Cell Biol. Vol. 78, pp: 139-153. Chelladurai, G.; Veni, T.; Mohanraj, J. and agarajan, R.N., 2014. Effect of Herbal Extracts Supplemented diets on Non Specific Immunity and Resistance to Aeromonas hydrophila in Indian cat fish (Mystus montanus). Journal of Zoological and Bioscience. Vol. 1, No. 1, pp: 10-14. Citarasu, T.; Sekar, R.R; Babu, M.M. and Marian, M.P., 2002. Developing Artemia enriched herbal diet for producingquality larvae in Penaeus monodon. Asian Fish Sci. Vol. 15, pp: 21-32. Dar, S.A.; Ganai, A.F. ; Yousuf, A.R. ; Balkhi, M.U.H. ; Bhat, T.M. and Bhat, F.A., 2012. Bioactive potential of leaf extracts from Urtica dioica L. against fish and human pathogenic bacteria. African Journal of Microbiology Research. Vol. 41, pp: 6893-6899. Douglass, J.W. and Jane, K.W., 2010. Schalm’s Veterinary Hematology. John Wiley and Sons, Blackwell Publish­ing Ltd. 1232 p.
Dugenci, S.K. ; Arda, N. and Candan, A., 2003. Some medicinal plants as immunostimulant for fish. Journal of Ethnopharmacology. Vol. 88, No. 1, PP: 99-106. FAO. 2014. Aquaculture Department The state of world fisheries and aquaculture 2014. Food and Agriculture Organization of the United Nations, Rome. 243 p.
Fazio, F.; Marafioti, S.; Arfuso1, F.; Piccione1, G. and Faggio, C., 2013. Comparative study of the biochemical and haematological parameters of four wild Tyrrhenian fish species. Veterinarni Medicina. Vol. 58, pp: 576-581. Feldman, B. F.; Zinkl, J. G. and Jain, N.C., 2000. Schalm's Veterinary Hematology. 5th ed. Lippincott Williams and Wilkins. pp: 1120-1124. Gabor, E.F.; Şara, A. and Barbu A., 2010. The effects of some Phyto-additives on growth, health and meat quality on different species of fish. Scientific Papers: Animal Sciences and Biotechnologies. Vol. 43, pp: 61-65. Ghasemi, H.A. ; Taherpour, K.; Hajkhodadadi, I. and Akhavan-Salamat, H., 2014. Comparative Effects of Nettle (Urtica Dioica) and Commercial Feed Additives on Productive Performance and Blood Lipid Profile of Broiler Chickens. Journal of Animal Science Advances. Vol. 4, pp: 633-640. Ghiraldelli, L.; Martins, M.L. ; Yamashita, M.M. and Jeronimo, G.T., 2006. Ectoparasites influence on the hematological parameters of Nile tilapia and carp cultured in the State of Santa Catarina, South Brazil. Journal of Fisheries and Aquatic Science. Vol. 1, pp: 270-276. Graham, M.S. ; Haedrich, R.L. and Fletcher, G.L., 1985. Hematology of three deep-sea fishes: A refection of low metabolic rates. Comparative Biochemistry and Physiology. Vol. 80, pp: 79-84. Haney, D.C.; Hursh, D.A; Mix, M.C. and Winton, J.R., 1992. Physiological and hematological changes in chum salmon artificially infected with Erythrocytic Necrosis Virus. Journal of Aquatic Animal Health. Vol. 4, pp: 48-57. Houston, A., 1990. Blood and circulation, In: Shreck CB, Moyle PB (Editors). Methods for fish biology. American Fisheries Society, Bethesda, Maryland. 704 p.
Kori-Siakpere, O.; Ake, J.E.G. and Idoge, E., 2005. Haematological characteristics of the African snakehead, Parachacnna obscura. African Journal of Biotechnology Academic Journals. Vol. 6, pp: 527-530. Krystofova, O.; Adam, V.; Babula, P.; Zehnalek, J.; Beklova, M.; Havel, L. and Kizek, R., 2010. Effects of Various Doses of Selenite on Stinging Nettle (Urtica dioica L.). International Journal of Environmental Research and Public Health. Vol. 7, pp: 3804-3815. Ling, N. and Wells, R.M.G., 1985. Plasma catecholamines and erythrocyte swelling following capture stress in a marine teleost tish. Comparative Biochemistry and Physiology. Vol. 82, pp: 231-234. Macey, D.J. and Potter, I.C., 1981. Measurements of various blood cell parameters during the life cycle of the southern hemisphere lamprey, Georria austrulis Gray. Comparative Biochemistry and Physiology. Vol. 69, pp: 815-823. Murray, S.A., 1984. Hematological study of the bluegill Lepomis macrochirus Raf. Comp. Biochem. Physiology. Vol. 78A, pp:787-791. Murray, S.A. and Burton, C.B., 1979. Effects of density on goldfish blood-II. Cell morphology. Comparative Biochemistry and Physiology. Vol. 62, pp: 559-562. Muiswinkel, V., 2008. A history of fish immunology and vaccination I. The early days. Fish and Shellfish Immunology. Vol. 25, pp: 397-408. Nafisi Bahabadi, M., Banaee, M., Taghiyan, M. and Nematdoust Haghi, B., 2014. Effects of dietary administration of yarrow extract on growth performance and blood biochemical parameters of rainbow trout (Oncorhynchusmykiss). International Journal of Aquatic Biology. Vol. 2, No. 5, pp: 275-285. Peyghan,R. ; Khadjeh, GH.H. and Enayati, A., 2014. Effect of water salinity on total protein and electrophoretic pattern of serum proteins of grass carp, Ctenopharyngodon idella. Veterinary Research Forum. Vol. 5, pp: 225-229. Popescu, I.C. and Si colab, M., 1990. Tehnologii de refacere, substituire şi ameliorare a cvercetelor slab productive (Remake, substitution and amelioration techenologies for low productive oaks), Bucureşti. Ranzani-Paiva, M.J.T. ; Felizardo, N.N. and Luque, J.L., 2005. Parasitological and hematological analysis of Nile tilapia Oreochromis niloticus Linnaeus, 1757 from Guarapiranga reservoir, Sao Paulo State, Brazil. Acta Scientiarum. Vol. 27, pp: 231-237. Rehulka, J., 2000. Influence of astaxanthin on growth rate, condition, and some blood indices of rainbow trout (Oncorhynchus mykiss). Journal of Aquaculture. Vol. 190, pp: 27-47. Ruane, N.M.; Nolan, D.T. ; Rotlant, J.; Costello, E.J. and Weendellar Bonga, S.E., 2000. Experimental exposure of rainbow trout Oncorhynchus mykiss (Walbaum) to the infective stages of the sea louse Lepeophtheirus salmonis (Kroyer) influ-ences the physiological response to an acute stressor. Fish and Shellfish Immunology. Vol. 10, pp: 451-463. Sajfrtova, M.H. ; Sovova, L.; Opletal, and Bartlova, M., 2005. Near-critical extraction of β-sitosterol and scopoletin from stinging nettle roots. The Journal of Supercritical Fluids. Vol. 35. pp: 111-116. Sales, J. and Janssens, G.P.J., 2003. Nutrient requirements of ornamental fish. Aquatic Living Resources, Vol. 16, pp: 533-540. Soengas, J.L. and Aldegunde, M., 2002. Energy metabolism of fish brain. Comparative Biochemistry and Physiology. Vol. 131, pp: 271-296. Soivio, A. and Nikinmaa, M. 1981. The swelling of erythrocytes in relation to the oxygen affinity of the blood of the rainbow trout, Salmo gairdneri Richardson. In Stress andFish(Edited by Pickering A. D.). AcademicPress, London. pp: 103-l 19.
avares, M. and Moraes, F.R., 2007. Leukocyte and thrombocyte reference values for channel catfish (Ictalurus punctatus Raf. ), with an assessment of morphological, cytochemical, and ultrastructural features. Veterinary clinical Pathology. Vol. 36, pp: 49-54.
omas, L., 1998. Clinical Laboratory Diagnostics. Lsl ed. Frankfort: TH-Books Verlagsgesellschaft. pp: 652-656. Torres, P., Duthie, G.G. and Tort, L., 1986. Statistical relations of some blood parameters along recovery from imposed stress in dog fish. Reu. Esp. Physiology. Vol. 42, pp: 7-14. Vesogh, G.H. and Mostageer, B., 1995. Freshwater fish. Press Tehran University of Iran. 317 p.
Viegi, L.; Pieroni, A.; Guarrera, P.M. and Vangelisti, R., 2003. A review of plants used in folk veterinary medicine in Italy as basis for a databank. Journal of Ethnopharmacology. Vol. 89, pp: 221-244. Wells, R.M.G. ; Baldwins, J.; Seymour.S. ; Christian, K. and Brittain, T., 2005. Red blood cell function and haematology in two tropical freshwater fishes from Australia. Comp. Biochem Physiology. Vol. 141, pp: 87-93. Wiegand, M.D. ; Hataley, J.M. ; Kitchen, C.L. and Buchanan, L.G., 1989. Induction of developmental abnormalities in larval goldfish, Carassius auratus (L) under cool incubation conditions. Journal of Fish Biology. Vol. 35, pp: 85-95.